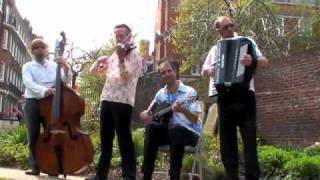 Marama Cafe Band - An intriguing Balkan Gypsy band that play inventive versions of everything from European folk & jazz through to atmospheric French café music. The repertoire of the Marama Cafe Band can be described very well in Romania as ‘cafe concert’ – meaning ‘a bit of music in all styles’ – says group leader Pete Watson. They began in the late 1990’s as rhythm section for the singer Ileana Rozavlea and in the early 2000’s morphed into a larger collaboration of musicians from the Balkans and the UK, playing music from cafe culture around the world. Having played at the National Liberal Club, National Theatre, exclusive London hotels and private homes, the band are keen to continue working together for the benefit of audiences and keen listeners. They also believe that they can learn a lot from each other and establish the concept of a Cafe Concert more widely in London and the surrounding counties. Playing Eastern European folk tunes, Romanian and Hungarian Gypsy music, Hot Club jazz, French musette and Argentinean tango, plus some original tunes (and a bit of Benny Goodman), this band is full of creativity, modern and inventive arrangements, high energy soloing and tight musicianship, peppered with humour and occasional short story comedy. A female singer can be added if required.